Fun costumes, good times with friends, lots of free candy… if you celebrate Halloween, what’s not to love about it? For most people who celebrate the holiday, Halloween is a carefree good time. But for some families, Halloween can be a stressful time if they’re on “hyper-alert” for food allergies. While most kids are happily taking candy from trick-or-treating, others are carefully sorting out which candies are “safe,” which are not safe, and which are “questionable” (which is to say, still not safe). This is why for the last few years you may have noticed some teal-colored Halloween pumpkins at some people’s homes, or signs about the Teal Pumpkin Project. This is a campaign that encourages families and businesses to provide a safe trick-or-treat option for kids by having allergen-free or non-food items to hand out. The campaign is the work of Food, Allergy, Research & Education (FARE), a non-profit organization that took a local project (it was started in Tennessee) national in 2014. 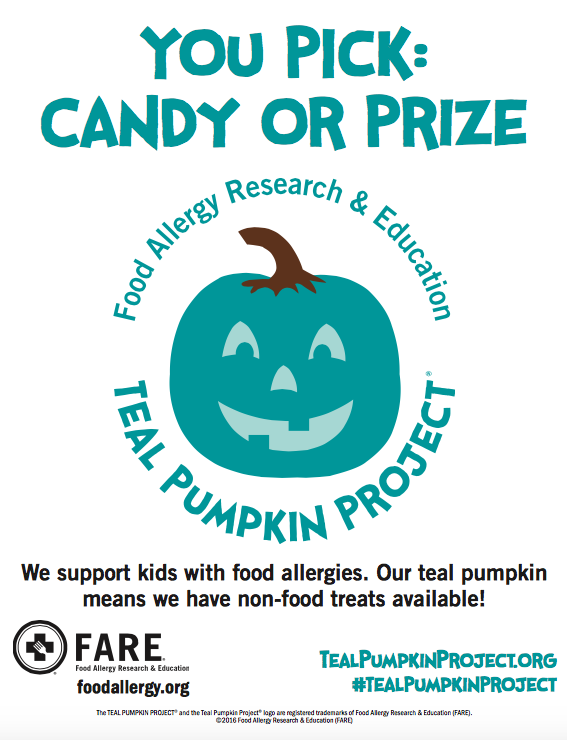 Its goal now is to reach not just everyone across the country but across the world, encouraging homes and businesses to show readily, via the teal pumpkin (or signage) that allergy-friendly treats are available. Last year, households from all 50 states and 14 countries participated. This is a worldwide movement to create a safer, happier Halloween for all trick-or-treaters. For those of us whose kids have allergies, this is a welcome campaign. My son has gotten by okay with us carefully “analyzing” his bag and removing the items he can’t have (which he trades with friends for other goodies) but the more houses that participate in something like this, the more of his original “loot” that he’ll get to keep. Buy some “allergy-friendly” treats. These can be candies or snacks that don’t have the most common allergens, or non-food treats. For the food items, it will be difficult to rule out ALL allergens — peanuts, tree nuts, milk, wheat soy, gluten, and more — so keep it simple with just a few choices, and know what is in them. Some good choices for candies are Sixlets (peanut- and nut-free little chocolate balls), gummi bears, fruit chews, Pixy Stix, and fruit snacks such as Welch’s Fruit Snacks; non-sweet treat ideas include pouches of pretzels, Goldfish crackers, or Pirate’s Booty. In our home, the food items we are handing out — Sixlets, Haribo gummi bears, and the Welch’s Fruit Snacks — may not cover all allergens but at least they will be peanut-and tree nut-free. Ideas for non-food handouts include glow sticks, small wind-up toys, spinning tops, or other cute but inexpensive items. 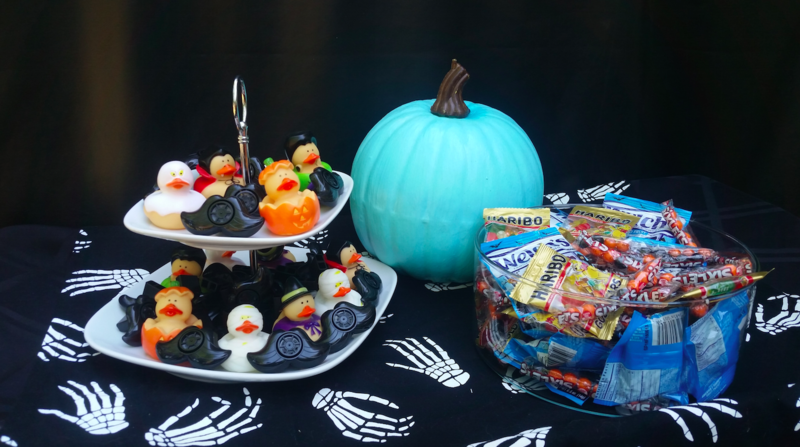 In addition to the food treats, we also will have on hand little Halloween rubber duckies and mustache-shaped whistles that I got from Oriental Trading Company. To make sure we have enough, I am keeping both these and the allergy-friendly treats separate from our regular trick-or-treat stash. You can buy pre-made teal pumpkins (I got the one above also from Oriental Trading Company) or buy a teal pumpkin decorating kit online or from a craft store. The simpler option, of course, is to simply visit a local pumpkin patch for a regular pumpkin, and then spray-paint it teal. In addition to or instead of a teal pumpkin, you also can place a sign that indicates you have allergy-friendly treats. FARE has several free signs you can download and print to display in your window or front door to let trick-or-treaters know you are participating. See below for some sample signs. The FARE site also has flyers you can print, a template for stickers and goodie bag labels, images to share on social media, and more. If you want to let your neighbors know your house is a Teal Pumpkin home, you also can register online with FARE. The site enables people to find participating homes via a searchable map. Do you have any other ideas for an allergy-friendly Halloween? Share your tips with our readers by commenting below! 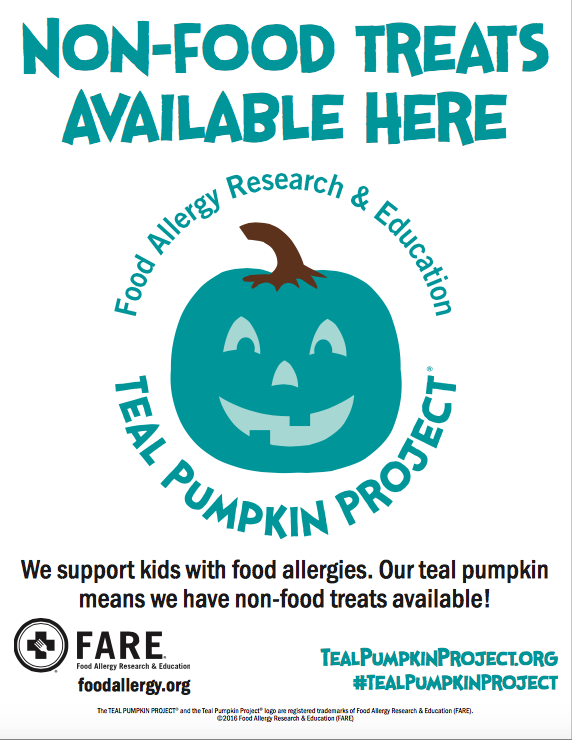 The TEAL PUMPKIN PROJECT® and the Teal Pumpkin Project® logo are registered trademarks of Food Allergy Research & Education (FARE) and are used with permission for public awareness purposes. Share the post "Teal Pumpkin Project: the allergy-friendly Halloween campaign"